Made for Silver 50 cent pieces, Morgan Silver Dollars or round Cabochon Jewelry Inserts. while others have inserts for BOTH the larger silver dollar (1.5 inches) and the smaller silver dollar. standard silver dollar and not the older and larger silver dollars. Note; The most recent update on my buckles is from my vendor. He infromed me that many of the vendors received the same letter he did; that the buckle manufacturer they received supplies from was going out of business and would no longer be able to offer belt buckle blanks. 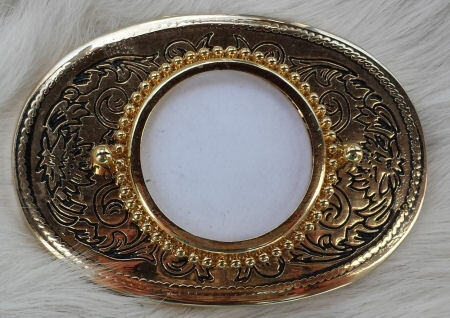 He said he, and others, have tried to contact them to at least see if someone else would be able to take over the manufactguring part of the business and at least keep up on the sales of these buckles, but to date, he has said he personally has recdived no reply. For now, I've kept the photos up of the buckles that are sold out in the hopes that I might be able to find exact replacements. 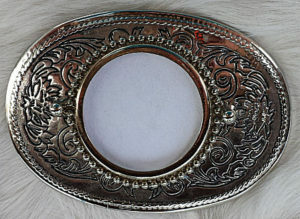 I will continue to look for replacement buckles or, if I can't find them, to at least locate new buckle blanks. RECENT DEVELOPMENTS As of this week, my most recent order to my supplier was short several buckles because he has almost all of them sold out. and I was refunded that missing part…which was disappointing. I have a few new ones, 2 styles, that I will be putting up and I will go over the few I have on hand to make sure I have them, and that they are sellable with no damage to them, but once they are gone they are gone. My most recent orders were taken by two customers who bought all that I had. The American manufacturer that was making these is no longer in business. Chinese goods are not an optinon for many of us business owners as they #1 .don't keep an American business operational and #2, the goods are NOT of high quality. We are exploring possible options at this time and will update this page with that new info when, or IF, we are able to find any new possibiliy that is a workable solution or even if we are able to locate some of these buckles again though it may be only a few. Gold Tone MUCH brighter than pic. 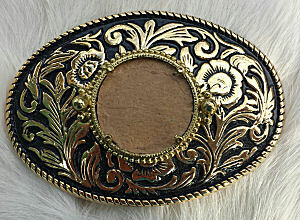 For a Cabochon Insert. This insert will also accomodate a 1.5 Inch coin. This insert will ONLY accomodate a 1.5 Inch coin. BBB-2AL NO LONGER AVBLE 3" x 2 7/8"
This insert will also accomodate a 1.5 Inch coin. This insert will ONLY accomodate a 1.5 Inch coin. Nice Black and Silver Contrast and detailing. This insert will ONLY accomodate a 1.5 Inch coin. 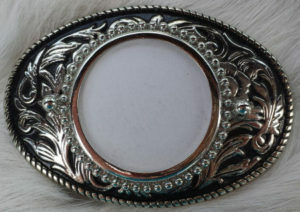 This insert will accomodate BOTH a 1.5 Inch coin or a 1 3/16"
BBB-1AL #2 NO LONGER AVBL 3" x 2 7/8"
This insert will accomodate BOTH a 1.5 Inch coin or a 1 and 3/16 "
Belt Buckle Blank, Silvertoned Rectangular Buckle For a Cabochon This insert will accomodate ONLY a 1.5 Inch coin. BBB-4 AL 2 avble 3 x 5/8 x 2 1/2 "
Order a buckle? Liked what you saw? Or have a question? Feel free to leave a comment! 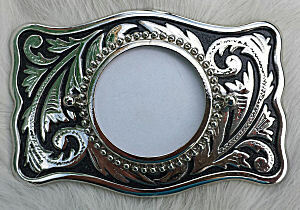 Are you looking for belt buckle blanks for silver eagles or just stating that you have them? 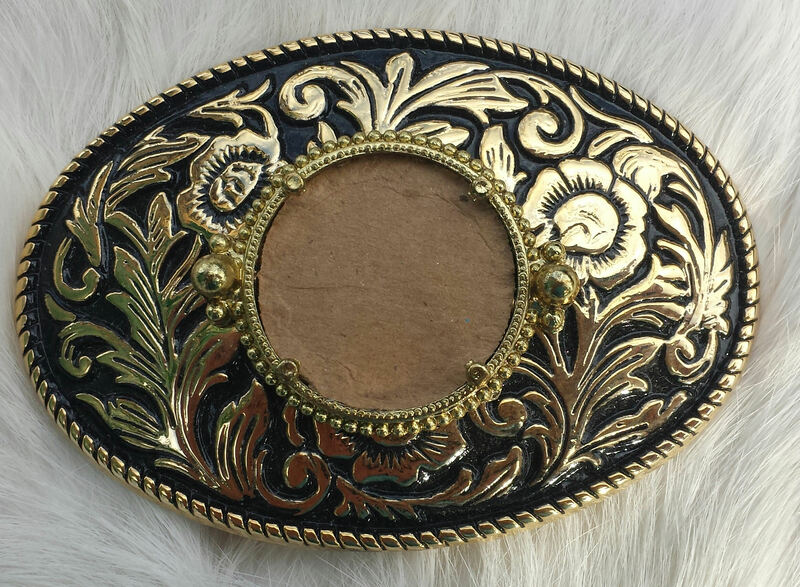 Do you have 5 belt buckles that will hold a Morgan silver dollar? Is there anyway you can get me measurements? How wide are these Morgan dollars? If you can get me a bit of info, I'll look into seeing what I have or what I might be able to get for you. UPDATE: Ryan, I’ve replied to you by email and yes, the buckles with the larger rings will accommodate a larger silver dollar, like the Morgan silver dollar, which I believe is 1.5 inches. I replied to you by email awhile back and was wondering if you had found what you were looking for? We don’t carry anything that size, and i’m not sure many people do. 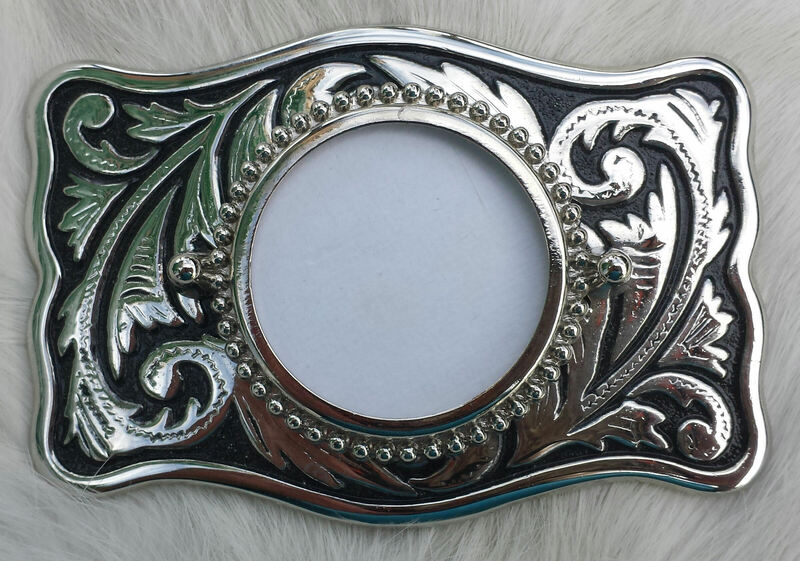 it’s quite large and while it’s possible to have a custom buckle made, the cost is alsmot prohibitively expensive. The cost comes from making a mold for an original buckle as the molds are usually used to produce many more, not just the one.